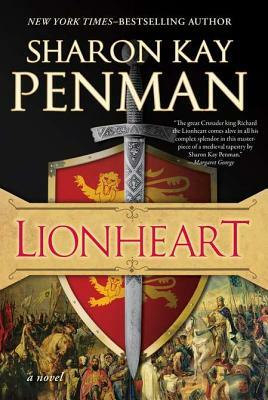 Lionheart is Sharon Kay Penman's new novel about Richard I's time on crusade in the Holy Land. It is, like all her novels, epic in scope, with an impressive amount of detail and a lot of research. I have not read the two books that come before it in this series- Time and Chance and Devil's Brood- though I read the first in the series on this fascinating Angevin family, When Christ and His Saints Slept. This book picks up right around Richard's coronation, after which he promptly left (on a somewhat meandering journey) to the Holy Land to pit his own military prowess against that of Salah-al-din in hopes of regaining Jerusalem for Christians. The Angevins are one of the most interesting families in western history- they have a sordid history of deceit and distrust and ill will, and while I can't imagine that it was at all fun to be living under their rule, it is a lot of fun to read about them. I should have read this series in the proper order, but I confess that I found When Christ and His Saints Slept to be very long, repetitive and lacking spark, so I wasn't very motivated to read its sequels. But Richard the Lionheart is one of those giants of history, still very well known today. And I loved SKP's book about another Richard, Richard III, in The Sunne in Splendour (in fact, it was the first book I ever blogged about! ), and I was confident she would do justice to this one. And she does. Complex people and matters often dwindle down in history to short, extreme statements that ignore the many nuances that existed at the time. Richard the Lionheart is often remembered as a battle-hungry man who cared nothing for his kingdom, but just wanted to fight all the time, so he went on crusade. And while that may very well be true, he was also a brilliant military leader, a savvy ruler and a highly educated man. Penman does in this novel what she does so well- she portrays Richard as a complex, quick-to-anger, confident man that was fully worthy of being his famed mother's favorite child. He dominates the story, setting all the other characters in the shade and becoming a fully fleshed-out and engaging hero of the story. I thoroughly enjoyed learning more about him. However, when one person so dominates the story, it's hard to feel very engaged with the other characters in the story. There were several smaller characters that were lost in the shuffle. For example, Penman begins the book with a chapter told from the point of view of a young girl, Alicia. But we rarely ever see Alicia after those first couple chapters. Richard's sister Joanna gets more time on the page, but she seems set up only to play the semi-cardboard role of the unsubmissive woman who voices her mind, as compared to Richard's soft-spoken wife, Berengaria, who is a soft-spoken woman that Richard doesn't seem to spend much time thinking about. In a way, the only other character that could have shared this book with Richard on equal footing is someone who was equally dominant and historically compelling, Saladin himself. I would have loved to spend some time in his head, and get a more balanced view of the Third Crusade. I know that Penman focuses on Medieval British history, so it is too much to ask, but I think that would have made me much more engaged with the story. As it was, I felt uncomfortable reading this book. Religious warfare is something I have much trouble swallowing, even when placed in its historical context. I can't help but shudder when I read one side calling the other "enemies of God" or believing so strongly, fanatically, that they are on the side of right just because they happened to be born in a region that follows one religion as opposed to another. You can say all you want about historical context, the medieval world being different and dominated by religion, etc., etc., but while I know that in my mind, I am still extremely uncomfortable with the death toll over the centuries that has risen over differences in religious beliefs- this book puts that in very stark reality, and it feels like such a waste, as even a thousand years later, that area of the world is still being bitterly contested over, still in the name of God. Penman goes into great detail about a lot of battles and even more skirmishes, and as the book weighs in at almost 600 pages, I feel that some of these could have easily been left out. It became repetitive, hearing how often Richard recklessly risked his life, got hurt or ill, and then worried his wife, sister and followers with the possibility of his death. And then he'd be up again to win another brilliant victory and the cycle would begin again. It got tiring to read, so I can't imagine how tiring it must have been for Richard himself, actually living through it! The book was so focused on describing the dances of maneuvering: military decisions in trying to retake the holy land, dynastical decisions about who should rule Sicily, Cyprus and Jerusalem, and political decisions on how to fight a holy war when you don't trust anyone on your side. It is an interesting historical period, but by focusing only on Richard the Lionheart, readers get a fairly one-sided view, and it results in a lot of information-dump-type paragraphs and conversations. I enjoyed this book for its portrayal of Richard the Lionheart, but it did not have the spark for me that Penman's The Sunne in Splendour or Here Be Dragons did. I did not leave the book with a deep and abiding respect for Richard I as I did for Richard III, or with a thirst to learn more about the Crusades as I wanted to learn more about Wales. The overriding opinion I have seen of this book so far is that it isn't as good as her earlier books! I think I am going to try to read Time and Chance and The Devil's Brood before I tackle this one. I'm definitely not looking forward to this book as much as I was before, and have normally for Penman's other books, after this review. I'm especially put off by the constant battles. I like a battle as much as the next medievalist, but not over and over again! I was so curious to see this review because as you know, I am going to be reading this one. I had hoped to have gotten started with it, but am still regrouping after my trip. There are some elements about this book that fascinate me, and because I know very little about the subject, I think it will be a good read for me. But then again, the repetitive aspects of the story kind of make me nervous because this is a long book, and I don't want to get stuck. I am at least glad to be aware of it going in thanks to you! I think you wrote a really great review and I am interested to see what I think of it now. Many of the reviews I've read on Lionheart have the same issues you list. Too much battle and detail that becomes repetitive. I've been hesitant to read it, fearful I'd find it a bit dull. I've read all the previous books in this series, so I was torn. Ultimately, I think I'm going to hold off on this one. I felt When Christ and His Saints Slept was tedious compared to Sunne and her Welsh trilogy. Now, after what I'm reading about Lionheart, I think I'm going to find it more of a chore to read than enjoyable. Take note, though, Time and Chance is great, I think I gave it 5 stars. The dynamic relationship between Henry and Eleanor and Henry's problem with Beckett made it a fascinating read. Devil's Brood was a sad subject for me, seeing Henry II age and die, but Eleanor makes it all worthwhile! Penman is one of my favorites, but I'm afraid I'm going to hold off on Richard. Marg - Yes, I think you can take your time getting to this one, and maybe after reading the books that come before, you'll have a better gauge of Richard than I did at the start of the book. Meghan - Yes, agreed! So. Many. Battles. And all with basically the same resolution, or lack thereof. I would have been fine with a few being glossed over! Zibilee - Yes, I look forward to hearing your thoughts on this one. I agree that the subject and the location are pretty fascinating, but I just didn't love it. Would love to hear your thoughts when you finish it! That's too bad this book isn't going over very well. I have only read the one book by Penman so far, so I am not a really good gauge of her writing, but until this book I had always heard mostly positive things. I just finished "Lionheart" yesterday and I loved it. I thought it was historical fiction at its best. I actually enjoyed reading about the battles, the strategies and about Richard I being both a reckless solider, yet a careful commander who takes great care to minimize his own men injuries. This is the first book I read by Sharon Kay Penman so I have nothing to compare it to but I loved how she built the story around the history and not the other way around. I would like to read this eventually but I think I'd prefer to start with the earlier books in the series and read them in the correct order. And I still need to read Here Be Dragons, which I bought immediately after finishing The Sunne in Splendour and still haven't read yet. It could be a long time before I get to this one! Kelly - Yes, generally I like her writing. I think Here Be Dragons and The Sunne in Splendour are her best works, though. Blodeuedd - Ooh, which one do you have your eye on?! Man of la Book - I could certainly see if you enjoyed reading about the battles and strategies, that you'd enjoy this book much more than I did! Helen - Haha, I think all readers know that feeling! It will be ready for you when you get there. Mercy, I need to read The Sunne in Splendour already. I love Richard III in the first place! I am sure I would love a book about him! Unrelatedly, I feel like someone told me once that Richard I was probably queer. Did the book address this? Because I have no idea how this idea became planted in my mind, and I'm concerned it may be false. For several years I was inexplicably convinced that Scott Cohen had killed his wife, and I consequently hated him, and this proves to have been baseless. Jenny - Yes, the book DOES address this, in the author's note. Apparently, this rumor about Richard only arose around 1948, and clearly, no one alive at that time would know. The idea was never planted about Richard during his lifetime and as SKP reasonably points out, he had more than enough enemies that if they could accuse him of that, too, they would have. So I think it was probably baseless and put about by a scandalmonger. I think there are a lot of people I have baseless dislike for, on the same premise you do! Poor, innocent sufferers of the Wrath of Aarti. I think Richard the Lionhearted was typical of nobility in those days, overconfident, warlike and a raging egomaniac. As far as religion being a basis for war, I'm wondering if there's only a certain segment of today's society that feels that it's not important. Back in "the old days" I'm pretty sure religion was code for power, money and land. Religion is what you used to stir up the masses. I've never read one of her novels, but I can see their appeal; I would have loved to have had something like this when I was taking those history courses whose texts just never seemed to 3D folks like RtheLH! Richard the Lionheart was one of my favourite kings as a child when I was obsessively reading about British history (plus I think he came up in Stevenson's The Black Arrow and Jean Plaidy also wrote a novel about him). But like you, I'm no longer enamoured of stories about religious warfare, even the crusades, so although I haven't read anything by Penman yet (I know, the horror!) I think I may try the Sunne in Splendour first since Richard III is actually a king that is complex, misunderstood and may not in fact have been that evil. Fascinating stuff.